Bitcoin Voting. | Do. Be. Interesting. Here’s my attempt to delve deeper into how Bitcoin voting works without using the words hash or blockchain or even “ledger”. I realized after I summarized the Bitcoin voting process in my Bitcoin Cheat Sheet, you might have been imagining something like each voter raising their hand and saying “aye” on the Senate floor. Nope, that’s not it at all. It’s much more chaotic than that. With Bitcoin voting, there’s no limit to how many times you can vote or how quickly you can vote. Imagine every voter casting their votes onto a huge pile of paper that grows and grows, with each voter creating and throwing their paper votes on top of the pile as fast as they possibly can. Except that instead of using paper, they’re voting at the limits of their computing power, casting their votes at the speed of light, creating specialized computing hardware optimized specifically to vote as fast and efficiently as possible—anything they can do to vote faster and faster. 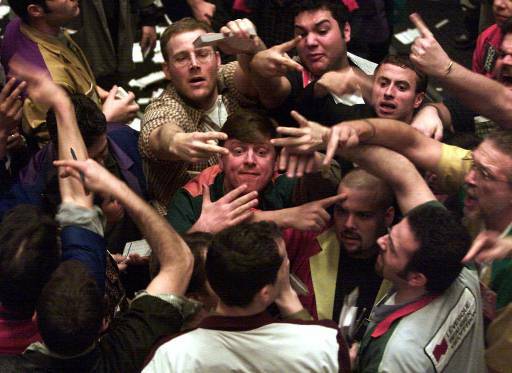 You thought the New York Stock Exchange trading floor looked chaotic? That’s a snooze fest compared what’s happening with Bitcoin. Right now some are estimating that Bitcoin voters are consuming more electricity per year than entire countries like Ireland. On top of that, each voter is free to vote for anything they like—they can even propose to give themselves a fortune and vote for that. So how in the world could such a chaotic system succeed? The answer is that it succeeds because the voting is controlled by humans who are by nature selfish. Being selfish is a bad human trait, right? In order to build a trusted system like currency, everyone in control has to be good and benevolent, right? Bitcoin is specifically designed on the premise that every voter will be a selfish jerk. It’s actually this very predictable human behavior that makes the voting system effective. Think about the possible outcomes of this voting process. Imagine that every voter votes to give themselves lots of Bitcoin—essentially starting their own new pile hoping for votes. If everyone is predictably selfish, they won’t vote on anyone else’s pile, nobody will agree on anything, the whole system will collapse, and nobody will make any money. Not a good outcome for a selfish jerk. If you think it through as a selfish voter, the only vote that has any chance of making you any money at all is one that everyone else agrees is fair. No selfish voter wants to give any other voter an advantage, and knowing that every other voter is selfish too, it’s useless to try to vote for an advantage for themselves because nobody else is going to vote for that. So it’s only the agreed-upon fair pile of votes that grows so quickly it’s impossible to comprehend. You can imagine transactions being thrown onto this growing pile, interleaving with the votes, so that the first transaction on the very bottom of the pile has effectively collected in its favor every vote ever cast. This pile of votes grows infinitely and as it gets higher, it weighs down all of the transactions underneath, securing them further. In my analogy, it’s not physical weight, but rather the weight of all of the combined computing power behind that incomprehensible number of votes. And now I can explain why it’s so difficult for an outsider—someone not invested in the long-term success of Bitcoin—to jump in and cheat everyone else. In order for their unfair vote to succeed, the cheater has to build the pile of votes on their stack higher and faster than everyone else combined who is voting for the fair stack. That’s the only way to be accepted by everyone else—to become the new majority. Since every other vested voter is furiously voting at the peak of their capacity in their own self-interest, this is a daunting and practically impossible task. No cheater has enough computing power to outweigh all of the other voters trying to protect and grow their own investments. And it gets more and more difficult as the votes continue to pile up at breakneck speed. New transactions at the very top of the pile don’t have many votes on top of them yet, so they’re the most vulnerable. It’s theoretically possible that some cheater might be able to create a pile of votes fast and high enough to become the majority for a brand new unfair transaction at the top of the pile for a little while. But eventually, the massive voting power of the rest of the selfish jerks will overwhelm this one in a tidal wave and the cheater pile will be discarded as not part of the majority vote. And it’s not free to attempt a cheat. It’s costly to bring that much computing power to bear to try to cheat, only to get beat down by the majority. Not worth it. This is why you wait a while before considering a Bitcoin transaction you’ve received to be safe and irreversible. You’re waiting for the stack of votes on top of it to pile up sufficiently that the chances of a cheater (i.e., the person who sent you the payment) reversing it become statistically insignificant (impossible). You want to be sure that the payment transaction becomes a stable part of the one big stack that everyone agrees is the fair stack. Ok, thus ends my description of Bitcoin voting, which you will hear other people refer to as “mining”, because that sounds more geeky and we all know that geeky is the new cool. This has gotten way longer than I originally intended, and now it’s pretty much just like every other explanation out there. If you’ve got more questions, feel free to ask. If you’re part of the majority vote, I’ll consider answering them.